BAM10 was a huge event, so the infographic with just a few of the key stats is very tall. Thank you to all the attendees, spectators, players, viewers, and event partners for making this the biggest open entry esports event in Australia! BAM10 Survey – Your Feedback! 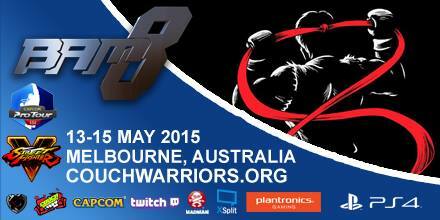 This year CouchWarriors celebrated its 10th year of Battle Arena Melbourne with BAM10. Our biggest event yet, attracting over 2000 attendees, BAM continues to grow and improve year on year. As part of the event this year we sought feedback from our attendees to get a better sense of what we are doing well and where we can improve. This years event featured the best of Australian and international talent in the fighting game community and there was no lack of entertainment. Matches were electric, with spectators on the edge of their seats, holding their breath as players battled right down to the last inch of health before triumphing. Besides the usual tournaments we also had our first appearance of Nintendo hosting both Splatoon 2 and Pokken tournaments and the PC LAN area that hosted its own tournaments. Let’s take a look at the survey! 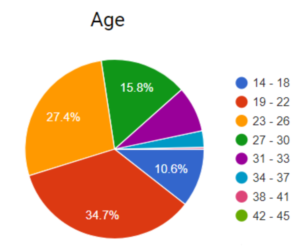 The attendees of BAM10 are all kinds of ages with our attendees being mostly between the ages of 14-30. Most of the respondents were male (96%) but our female community is growing with female respondents competing in events across BAM10 including Street Fighter, Smash Bros. 4, Splatoon 2 and Dragon Ball FighterZ. Most of our attendees had attended a BAM event in the past (60%) but we had a lot of first timers attend this years BAM. Of those who had attended previously, most people had attended more than two events. 78.5% of responses were competitors with most people competing in Tekken, Dragon Ball FighterZ and Street Fighter. It was a big job for some our TO’s this year with so many different games being run at BAM10. CouchWarriors has been working hard to ensure tournament bracket updates are timely and easy for people to access. Our community’s feedback showed that this really came through with 89% satisfied with the running of brackets, 84% satisfied with bracket updates and 81% satisfied with the equipment provided. There were shout outs to our TO’s for doing an amazing job as well as a request for more TO’s to help with some of the larger tournaments to reduce stress if possible. BAM10 was a massive hit with our community with 93% definitely coming back next year and 94% recommending BAM to their friends. When asked overall how satisfied people were with the event, there were no dissatisfied results which 96% being satisfied with BAM. This is an excellent result for Australia’s biggest Fighting Game Tournament and is proof of how our hard work, dedication and devotion to BAM is seen and experienced by our attendees. We’d like to thank everyone who completed the survey for their feedback. There was a lot of amazing ideas and we are looking forward to bringing them to life next year at BAM11!